There should be a rule against letting such colourfully inspirational leaders as Berlusconi from stepping down. The people behind this should be shot. Now that Italy’s given the boot to Berlusconi, reading news from that not-so-well-heeled country will not be the same as before. 😦 One fondly remembers the time when Berlo had poured scorn on Finnish food saying that he had had to “endure” it adding that there was absolutely no comparision between ham from Parma and smoked reindeer venison. The issue was regarding Italy’s bid to be chosen as a home base for the European Food Authority (which in turn would have meant a lot of benefit to the local Italian food processing industry). This was in 2005. 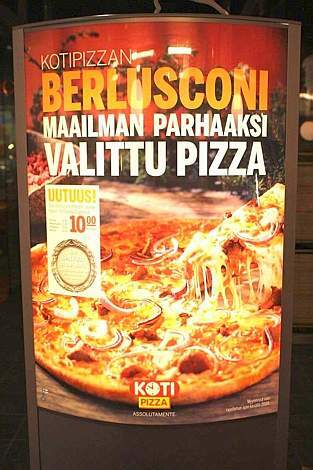 The last, somewhat consolatory laugh probably belonged to the Finns when Kotipizza Oyj, the largest pizza restaurant chain in the Nordic world, won the America’s Plate International Pizza Contest (in 2008) over their invention which was very aptly called “Pizza Berlusconi”. It has smoked reindeer in it. Italy is now a great country to invest in…a reason to invest in Italy is that we have beautiful secretaries…superb girls. Now, I am not sure if the chartists and technical gurus out there, who spend all their time reading between the (trend)lines have ever thought of mapping and charting hemlines. But Berlo obvisouly had spent a good deal of time on that subject and he let the world of high finance know. While he may not have intended it thus, this sermon might have proven to be very profitable indeed for an international investor with A) a very sharp memory; B) a natural ability to make logical connections and C) a Berlo like keen eye for beauty! Berlo’s view of short hems in Italian offices was to really serve as a trading signal to go “short” on Italy itself! I am sure many people made money shorting Italian bonds, stuffing profits in Italian bags and being long Italian credit protection. Also while Finland got their psychological payback via the Pizza Berlusconi, that episode also throws up an investing lesson. Being long on pizzas is not the same as being long on Italy itself. Towards that end, I came up with this chart which can be a good contender for one of the most profitable set-ups in recent times. Go LONG PIZZA + SHORT ITALY. Using metaphors, this could mean shorting the MSCI iShares Italy Index fund and going long on Jubilant Foodworks (the makers and sellers of Dominos Pizza in India). I have no idea how pizza foodchains are doing in other countries but Jubilant has been rocking. Though their dough is acting tough these days, what with the share price perilously close to the 200 SMA mark and questions being raised on the company’s ability to maintain its sales growth trajectory going forward.  Whatever happens to the share going forward, its performance in recent times has been awesome.